Eating out is a part of our lives. Whether it’s a dinner date with your spouse, a lunch meeting with clients, or a quick fast-food meal with your children, enjoying a restaurant meal is a special treat. However, many of us struggle with trying to stick to a diet plan when dining out. For the 84 million Americans affected by prediabetes, that’s a serious problem. After all, watching what you eat and building a nutrient-dense diet is one of the most important things you can do to stay healthy and prevent type 2 diabetes. The challenges to navigating restaurant meals are many. 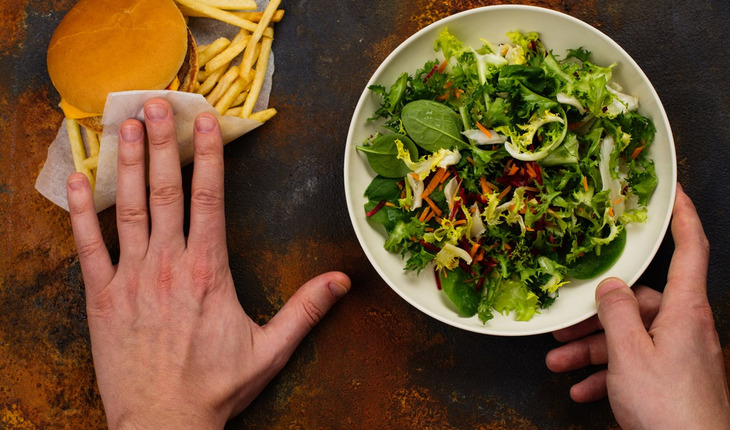 Portions are often huge, it’s hard to know which foods are swimming in sugar and saturated fats, and what sounds like a wholesome wrap or salad may be a calorie bomb in disguise. Despite these surprises and unknowns in restaurant meals today, eating out doesn’t have to knock you off course. With thoughtful planning and consideration, you can eat away from home without blowing your diet. Here are some strategies that can help you make smarter choices in any type of restaurant. 1. Treat it like it’s a special occasion only if it’s a special occasion. What was once a treat is now commonplace. Americans eat out much more often than they did a few decades ago. But for many, the idea of splurging when dining out sticks with them even if they visit restaurants a few times each week or even if they eat out daily. Throwing caution to the wind daily or a few times a week in restaurants is really not moderation and will likely make it hard to meet your health goals. Unless it’s truly a special occasion—a wedding anniversary, a birthday, a celebration of a job promotion, or similar event—treat it like any other meal. Try to mimic the portions you eat at home and balance your plate with more nonstarchy vegetables than other types of food. 2. Make a game plan and stick to it. Winging it rarely works when it comes to lifestyle changes. So before heading to the restaurant, set your plan. My most successful clients preview menus online and make their choices at home in a leisurely environment. They give themselves time to think through their options instead of being influenced by the orders of dining companions or nudges from the waitstaff. Last-minute choices are frequently less healthful. Check out Healthy Dining Finder by visiting http://www.healthydiningfinder.com/ to look for restaurants that offer healthful fare. It’s okay to ask questions about how the food is prepared when you’re dining out. Ask about the oils or fats used, and stick to heart-healthy liquid oils like canola, olive, and vegetable oils. As much as possible, avoid butter, lard, coconut oil, and bacon grease. Choose leaner cuts of meat such as skinless poultry, baked and broiled fish, and top sirloin steak. Inquire about sauces as well. Are they rich in fat or added sugars? A lot of people are too inhibited to make special requests because they worry about being seen as difficult or insulting. “But my experience is nearly always positive, so do feel comfortable making your own requests. Can the dish be made with fish instead of beef? Please don’t bring bread or chips to the table. Will you ask the chef to use a light hand with the salt? May I have a different vegetable in place of French fries? Will you bring the sauce (or salad dressing) on the side? May I have marinara sauce instead of Alfredo sauce? Please leave the bacon off my sandwich. These questions are not demanding, and your waitstaff or the chef should not be offended. The answer might be no, and that means you may need another few minutes to make your selections. 5. Keep your overall healthy eating plan in mind. If your plan to go out to dinner includes higher-calorie fare, be mindful earlier in the day to keep calories in check. This doesn’t mean that you should starve yourself all day to binge at night. But it is wise to eliminate the extras at other meals. You might eat your lunchtime sandwich without a slice of cheese to save about 100 calories. And you could leave the croutons and ham off your salad. Also think about ways to get in enough fruits and vegetables, two food groups that are frequently lacking on restaurant menus. If you don’t think they’ll make it to your dinner plate, eat them at earlier meals and snacks. It’s common advice to eat a snack before heading out to a restaurant or a party. While this is good advice in some situations, it may encourage overeating in other situations. Instead of following blanket advice, assess your unique circumstances. If your meal is likely to be delayed, a small snack is in order. But if you’ve eaten adequately throughout the day and your meal out is at an appropriate time for you, you likely don’t need to pre-eat, and it’s probably better not to do so. If you do need a snack, think about what food group is lacking from your diet and go for that. Consider a cup of yogurt, low-fat cheese, a piece of fruit, or any vegetable, including vegetable juice. Once at the restaurant, be sure to order foods that are filling. Start your meal with a low-calorie salad or broth-based soup. Research studies show that this strategy helps to keep calories for the full meal lower. A few menu descriptors hint that the item isn’t prepared in a healthful way. When in doubt, ask your server. Be leery of menu choices with these words: Alfredo, au gratin, batter-dipped, béchamel, breaded, bisque, confit, creamy, crispy, crunchy, crusted, fried, fritters, gooey, golden, rich, roux, scalloped, smothered, sizzling, tempura, or white sauce. 8. Be aware of health halos of ethnic restaurants. Many people automatically assume that food in Asian or Middle Eastern restaurants is light and healthful because these cuisines tend to be rich in vegetables. But often the health halos are undeserved. The food may be prepared in more “American” ways and include more fat and a larger proportion of meat to vegetables. Even if the food was prepared exactly like it might be in the home country, that doesn’t mean that it’s light and health boosting. Every type of cuisine has indulgent foods. Don’t eat it just because it’s in front of you. If you don’t love it, push it aside. Who wants to use up their calorie budget on food that’s mediocre? If you’re dining at a buffet, give a good look at everything that’s served. The common tendency is to simply start loading up, so the foods at the front of the line tend to fill your plate. Be choosier and more deliberate. After scrutinizing the full buffet, select the tastiest and most healthful foods. 10. Slow down and pay attention. Focus on every sip and every bite. Taste it. Feel it. Notice the texture, temperature, appearance, flavor, and aroma. It’s easy to overeat or eat mindlessly when you’re distracted by conversation. Plus, research tells us that our dining companions influence how much and how rapidly we eat. We tend to eat more in large groups. And we tend to eat faster when our companions eat faster. Unfortunately, the faster we eat, the more we tend to eat. Really focus on your speed. These days, restaurants rarely serve small portions. Know that whatever is on your plate is typically more than you need. Sometimes you can request small portions or order from an appetizer or small plates menu. Ask if you can order a lunch portion at dinner or the appetizer portion instead of the entrée portion. Splitting menu items with a dining companion is commonplace these days, though there is often an additional charge of a few dollars. When your food comes, decide on a proper portion based on the amount you strive to eat at home. Draw an imaginary line through your food, and don’t cross that line. Alternatively, you can ask your server to box half your meal before it’s brought to the table. 12. Don’t drink your calories. Sodas, lemonade, sweet teas, and alcoholic beverages can cost you quite a lot of calories—several hundred, actually. Be clear on where you want to spend your calorie budget. If it’s on food—not drink—order water, unsweetened tea, and the like. 13. Reconsider the meaning of value. Some diners let cost influence their purchases more than any other factor. Other diners feel that they have to get their money’s worth by eating everything put in front of them. But there are other, more important, ways to assess value than to consider only the amount of money something costs. Pay attention to health value, nutritional value, and satisfaction value, as these can affect the way you feel immediately after eating and long-term. If cost is a major driving factor, choose the least expensive healthful item or share something with a friend. Or take some home to eat again at another meal. Two meals for the price of one is an excellent way to save money and better your health. Trying to eat healthy when dining out can be a tricky business, but it doesn’t mean you have to forgo dining out completely. “It’s perfectly fine to enjoy restaurant meals now and then, especially when you make healthful choices. These tips make it possible to enjoy a meal out and still keep your diet on track. Weisenberger is the author of Prediabetes: A Complete Guide: Your Lifestyle Reset to Stop Prediabetes and Other Chronic Illnesses. For more information, please visit www.jillweisenberger.com or www.diabetes.org.